Paramedic Dave Kroll joined St. Charles County Ambulance District [SCCAD] in June of 2015, just as the District debuted cutting-edge cardio-cerebral resuscitation [CCR] protocols. Though the CCR protocols have helped dramatically increase cardiac arrest survival rates in the county, Kroll knew the key to driving numbers even higher lied in getting lay rescuers comfortable with the idea and technique of providing high-quality chest compressions. He got involved in the District’s fledgling Lifesaver CPR effort, and today has ultimate oversight of the program, which trains thousands of individuals annually in hands-only CPR and choking relief. 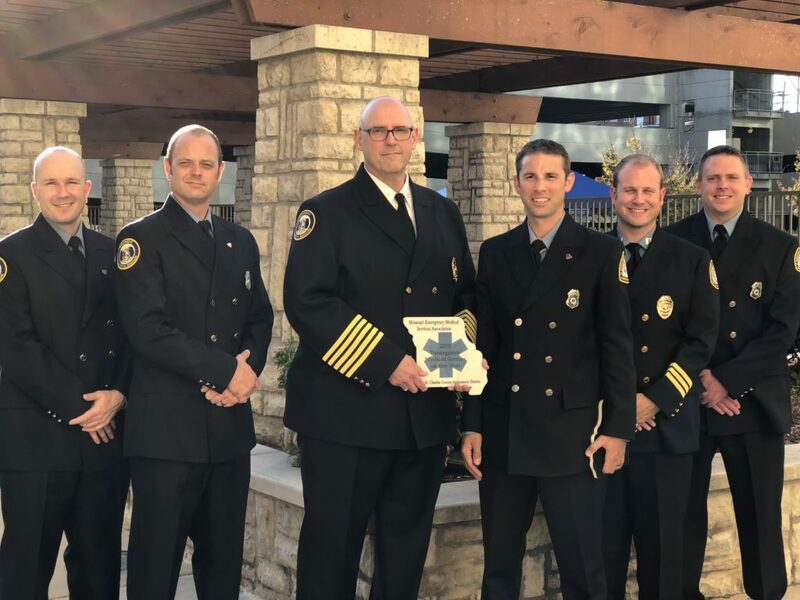 Last week, his commitment to increasing cardiac arrest survival rates was honored by the Missouri Emergency Medical Services Association with their 2018 Community Service Award. Lifesaver CPR sessions are offered regularly throughout the community at fairs, festivals and other events. There is no cost to participate, and the training is open to all ages. Innovation and collaboration were two of the key reasons cited by MEMSA for SCCAD being named 2018 Emergency Medical Service of the Year. Over the past two years, the District has launched several initiatives that point to an ongoing commitment to meet the evolving healthcare needs of citizens. These include a mobile integrated health program launched in partnership with BJC Healthcare, and a successful treatment referral program designed to help those affected by the opiate crisis. Most recently, the District debuted a telemedicine program developed in collaboration with Behavioral Health Response which enables Paramedics to initiate a telehealth encounter with a Masters-level clinician via iPad on select behavioral cases. 2018 marks the seventh time SCCAD has been named Missouri’s top EMS entity; the District previously received the honor in 2016, 2011, 2009, 1993, 1992 and 1990. The District covers all 592 square miles of St. Charles County, and last year responded to nearly 40,000 calls for service.